#10 of my Top Ten of 2015! Spheres of Power is one massive book – 230 pages, 1 page front cover, 2 pages of editorial, 1 page SRD, 3 pages of KS-backer-thanks, 2 pages of ToC, 1 page back cover, leaving us with no less than 220 (!!!) pages of content, so let’s dive in! As you can glean from the sheer length of this book, my usual in-depth analysis would bloat this review to extents unprecedented, so instead, I will paint in somewhat broader strokes than usual – also, since, apart from the well-written chapter-introduction fluff-texts, the vast majority of content herein is CRUNCH. So, the basic principle is pretty simple: Spheres of Power represents an alternate magic system that can work as a substitution for the default vancian casting and alongside it. Personally, I’d suggest using it as a replacement, mainly for a couple of reasons. For one, there is the factor of terminology. Spheres of Power utilizes the term “Caster Level” to mean something different – basically, it could be likened to the base attack bonus and, similarly, there are full, 3/4 and 1/2 progressions for classes and the like you’d convert to the system: Paladins, for example, would adhere to 1/2 CL-progression as “low casters.” Saving throws are no longer based on spell levels, and instead adhere to the classic 10 + 1/2 caster level +casting ability modifier, if appropriate. Casting ability modifiers (CAM) are dependent on the respective class used. Casting time ranges from 1 hour to 1 swift action and distances adhere to pretty much the concise close, medium, long distinction we already know from spells. Characters utilizing the Spheres of Power-system also utilize spell points equal to class level + casting ability modifier. It should be noted that the multiclass rulings for these basic components are VERY smooth and easy to grasp. Spheres of Power also introduces the MSB and MSD – Magic Skill Bonus and Magic Skill Defense. MSB is equal to total levels in casting classes; MSD is equal to 11 + total levels in casting classes. This becomes relevant in instances of pure concentration or when pitting your magical force against another caster becomes the relevant thing you’re trying to do. Concentration is d20+MSB+ability modifier – for spell-level interactions, an effect’s spell level is equal to 1/2 caster level, with the option of manifesting a magical effect voluntarily at a lower caster level to render concentration easier. Penetrating SR is done via d20+MSB – simple, elegant and the same ease also works for any call for CL-checks: You instead roll MSB. And that’s about the basics. The system’s core rules fit comfortably on two pages. That’s a GOOD thing. Even better, the presentation is so simple and concise, it renders grasping the system hilariously easy. There also is no divine/arcane divide anymore, just fyi – so yes, false gods and the like…suddenly a much more likely narrative option. It gets better: Magic is divided not into traditional schools and subschools, but into spheres. Each time your caster level increases, you get magic talents – these can be used to unlock new spheres OR to learn special tricks within your available spheres. You see, each sphere has basic abilities that work at-will (byebye, 5-minute adventuring day/nova issue…)…and others, that require the expenditure of spell points. Hence, you can actually remain relevant as a caster sans burning through your resources and still shine in your core competences – though, obviously, burning through your resources will yield its own benefits. This basic system also allows for exceedingly simple customization of existing classes into the frame-work of spheres of power, meaning you will not be missing out on your favorite 3pp-class or archetype, just because your group opted to go for Spheres of Power. From the very get-go, this radically changes how magic and particularly, magic specialists, work – you no longer have a specialization represented in things you can’t do, but rather by the things you CAN do AND, at the same time, you get magic that is less prone to resulting in nigh-godlike omnipotence casters at high levels – basically, sphere casters will excel at their given fields, with literally your choices each level mattering more than your class or its access to ridiculous amounts of resources, but at the same time, they will be at the same time more restricted. Magic at once becomes more manageable, but also more reliable and less bursty than in the vancian default. A total of 20 spheres are provided and each covers a significant array of utterly awesome options. Let’s take the Alteration-sphere as the first example, shall we? If you’re like me and have been delving into the gritty details of shapechanging and its mechanics, you’ll have noticed a serious array of pretty complicated details hiding in the proverbial shadows of polymorph-y effects – granted, the issues have been mitigated a bit by Pathfinder, but there still are ample instances wherein a particular modification of one’s body becomes problematic and requires some dedicated close-reading. Alteration’s basic ability, Shapeshift, requires a standard action to activate and shifts either you or a touched creature, with a duration of concentration. Unwilling creatures receive a save and necessitate the expenditure of 1 spell point to shift. Additionally, you can expend 1 spell point to maintain shapeshift for 1 round/caster level sans concentration for 1 spell point. The ability is codified properly as a polymorph effect, and yes, we get rules for interactions between shapeshift effects, allowing you to MSB-check to see which shift prevails. Targets affected lose extraordinary and supernatural abilities and instead gain those noted…and yes, equipment and magic item activation is also properly covered. Disguise-interaction can be found and intriguingly, targets can also be partially changed via blank form, granting them e.g. low-light or darkvision, natural attacks (all sporting the proper primary/secondary classification) or cosmetic appearances. Now this is the extent of things you can do with just access to the sphere – sans talents. Add talents into the fray and things become really interesting: Want to transform into animals or makes other creatures into humanoids? Check. Just affect the mind of the target, for a lycanthrope-like berserk, animalistic state? Check. Add lunging to natural attacks? Check. Poach amid nice monster abilities à la trip or tremorsense? Yup. Size changes? Bingo. You won’t be able to do them all unless you specialize, but if you wanted a shapechanger with a focus on the undead and vermin…well, here you go, 2 talents and you’re covered. And btw. : I am only lightly touching on the options one single sphere allows you to have…now contemplate what you can build with 20 of them! Obviously, the material provided herein not only shows some extreme care regarding its rules-language and set-up, it also needs, by virtue of its “alternate system”-ambition, be able to cover the most divisive aspects of magic, the ones with the most potential for issues…and beyond complexity beasts like aforementioned alteration, there are two spheres that pretty much exemplify the basic tenets of combat-centric magic: Destruction and Life. Destruction’s base ability is somewhat notorious, since it originally provided force-damage blasts at-will…which is a pretty nasty, since it is the best damage-type you can conceivably have and makes incorporeal foes too easy to eliminate. It is my happy duty to report that the damage-type has since been changed to bludgeoning, rendering the warlock-y blasting the sphere grants as a base ability less problematic. The scaling of +1d6 every odd level and the limited range still maintain reasons for non-magical ranged weapons to exist, though you can use talents to extend the range – again, a matter of player agenda. Each blast can be further customized by one blast shape and one blast type talent, which allows for some form of control. Now, yes, this is a pretty simple means of adding warlock-y blasting capacity to your caster, but at the same time, this is the one sphere I’m not completely blown away by – mainly, since I’m a huge fan of the highly customizable ethermagic introduced in Interjection Games’ Strange Magic-book: The variety there and the unique options as well as the damage-scaling are a tad bit more precise and refined and personally, I consider the resource-management there a bit more compelling…but know what? If you’re mathematically up to the task, you can fuse the two/recodify ethermagic as its own sphere – the easy basic structure of spheres of power allows for such blending and ultimate, that is perhaps the biggest strength of the system. The Life sphere, then, would be the other means by which a system could be broken: After all, this one is all about healing and by now you know how much I loathe any system that provides infinite healing. The Life sphere does just that…and at the same time, it doesn’t. The base, at-will ability, allows you to provide temporary hit points to a touched target, but only up to your CL and only when the target is injured – basically, you can band-aid minor injuries, while major ones require the expenditure of spell points for proper healing, which the sphere also provides. While quite a few minor negative conditions and even ability damage can thus be alleviated via the expenditure of spell points, the tying to the resources of the respective character (remember: One pool of points for ALL spheres…), suddenly, we have an interesting resource-management game here that emphasizes the severity of different injuries by virtue of whether they can be covered by invigorate or not. My one gripe here is that invigorate’s scaling could have been a tad bit less linear at higher levels, when damage far eclipses its usefulness, but then again, I can modify that to properly fit my own tenets with just a modicum of preparation and basic math. The impressive component with this sphere, at least in my book, is that it manages to provide an infinite source of HP-replenishment without breaking the game in play – even in relatively gritty contexts. Flavor-wise, it also does not suffer from in-game logic issues that haunt similar solutions or healing surges…so yes, consider me thoroughly impressed. These three spheres, highlighting some of the most problematic potential aspects, should provide enough insight on why this system as a base set-up, has merit…but we’re not just left with it. Instead, we get no less than 11 (!!!) base classes. The Armorist: d10, 2+Int skills, full BAB, good Fort-save 1/2 caster progression via Wis. This guy can create special bonded equipment (weapon, armor, etc.) with preset enchantments and swap between them on the fly in combat. Like it! The Elementalist: d8, 4+Int skills 3/4 BAB, good Fort- and Ref-save 3/4 caster progression via Cha. Take the Destruction sphere for free with slightly better elemental enhancements as well as some monk-y tricks like evasion. Another Airbender-esque class. Okay when you’re looking for it with Spheres, but I’ve seen cooler takes on the concept. The Eliciter: d8, 4+Int skills per level, 3/4 BAB, good Will-save, 3/4 caster progression via Cha. This guy is pretty much the instigator/enchantment-type of manipulator who supplements his spellcasting via 3+1/2 class level hypnotism-abilities; If gaslighting, (de-)buffing and generally being a good face is something you enjoy, then that’s a great class for the subject matter. The Hedgewitch: d8, 6+Int skills per level, 3/4 BAB, good Will-save, 3/4 caster progression via either Int, Wis or Cha, chosen at first level. This class chooses a tradition that can be considered a thematic “bloodline”-like concept that represents different takes on the concept of the witch, with individual, exclusive customization options. The Incanter: d6, 2+Int skills per level, 1/2 BAB, good Will-save, full caster progression via Int, Wis or Cha. This essentially can be summed up as the full-caster grab-bag class – basically, you can trade in things like domains and bloodlines (obviously minus spells and the like) for specialization points, which can be gained by losing the bonus feats of the class in ever-increasing amounts. The class also allows for such specializations to modify the spheres. Nice one. The Mageknight: d10, 2+Int skills per level, Full BAB, good Fort- and Will-saves, 1/2 caster progression via Int, Cha or Wis. This would be the pala, bloodrager, magus-y garb-bag class. With Stalwart (evasion for Fort-and Will-saves), it has one of my pet-peeve abilities at 3rd level and over all, feels a bit like it doesn’t really manage the grab-bag aspect that well…nor its own schtick. Among the classes presented herein, it’s perhaps one of the conceptually weaker ones. The Shifter: d8,4+Int skills, 3/4 BAB, good Fort- And Ref-saves, 3/4 caster progression via Wis, would, surprise, be the kind of druidy/alteration-sphere-specialist that lets you (and allies) go full blown wolpertinger via further natural attack/tricks and customization options. The Soul Weaver: d6, 2+Int skills, 1/2 BAB, good Will-saves, full caster progression via Cha. This would be the healer/cleric/necromancer-type character that is determined by channel energy and the duality of blessings and blights. Nice one! The Symbiat: d8, 4+Int skills, 3/4 BAB, good Ref- and Will-saves, 3/4 caster progression via Int. perhaps the class with the coolest fluff: Basically, you have a strange psionic aberration from the far realms/outer dark fused with your very souls, granting better tricks of the Mind and Telekinesis spheres and psionic-flavored additional tricks. Anime-Psion, the class, effectively. I like it enough to be thinking about how to blend this with DSP’s psionics. The Thaumaturge: d8, 4+Int skills per level, 3/4 BAB, good Will-save, full caster progression via Int, Wis or Cha. Theme-wise, this one is a bit occult-y, having the ability to enhance his tricks for the chance of backlash and a general sense of the Spheres of Power-class for the grittier games…make no mistake, though: These guys can still go pretty much blast-happy on foes. All right, so that would be the base-classes…but that’s not even close to the end of this massive book. Instead, next, there are archetypes – in fact, one for each core class. Don’t want to do the conversion work? Here’s what you need. Neat! The 10-level bokor PrC would be particularly feasible for campaigns featuring both spells and sphere-casting, since it can be envisioned as a hybrid vancian/sphere-caster. Nice if you require the like; personally, I think Spheres work better as a substitution. Okay, where things get interesting, at least for me, is with the advanced magic-chapter: Instead of smashing these components into the design of the vanilla spheres, the advanced magic talents provided can be envisioned as the rather brutal options: 2-mile darkness? Check. Tsunamis and summoning? Check – This section is absolutely, marvelously, brilliant. Why? Because it does right what so many systems like this do not get: There is a lot table-variation out there. From low-fantasy grit to epic high-fantasy, from magic suffused space-opera to horror-esque sci-fantasy, there are infinite ways to play the game – and this chapter collects the high-fantasy, huge AoE, narrative effects and takes that requirement off the GM’s shoulders: No skimming through the spheres and disallowing certain options – simply restrict this chapter (or unlock) it at your leisure and there you go. Quite honestly, this is absolutely stunning: Want to play a game where PCs can unleash tsunamis against dragon-fleets? Allow! Want to play gritty survival at low levels? Ban (at least for the PCs…)! Simple, elegant and as tightly phrased and presented as possible. A joy to read and a fistpump-worthy hell yeah moment if there ever was one. Secondly, rituals deserve special mention – know how I mentioned that imho, this works best as a substitution? If you’re like me, you will have rolled your eyes and thought: “Oh great, so module xyz, which banks on spell zyx, now won’t work.” Enter rituals. Basically, this allows you to redesign spells into sphere-based rituals that duplicate the spell’s effects and aligns them with spheres. While personally, I’m not a big fan of adding the power imbalance of the triple scaling axis of spells back in, particularly when a module requires the like, a limited system-transparency is thus maintained…and you can still tinker with the casting time (which is increased significantly) even further: This allows magic to have a Sword & Sorcery-style flair: Sure, there is the quick sphere-casting…and then, there is the time-consuming, dread, city-leveling rituals…and you can add wonderful lists of exotic components to the fray for further adventuring opportunities and means for the PCs to foil evil ritualists. Optional pricing and tables of strange effects further supplement this use of the rules. The Spellcrafting system that allows you to make your own magical effects, at least to me, somewhat pales in its actual requirement (seeing how many spells can be converted), but who am I to complain…particularly when my beauties, one of my favorite sub-systems, incantations, are covered as well? This book, at this point on my initial read, had achieved an almost creepy level of “EZG likes it” – something further escalated by the copious player options that not only manage to get counterspelling and circle casting and contingencies right; no, beyond mere feats and the like, it was the accumulation of casting traditions that further elated me to levels of joy seldom obtained: Basically, you choose boons and drawbacks for casting traditions, representing benefits and drawbacks of individual approaches to magic, with general and sphere-specific ones all coming together in one glorious customization fest that should have both players and GMS alike grin from ear to ear. Okay, but what about the magic items? One whole chapter is devoted to magic items, crafting and modified effects, further underlining the massively-detailed, holistic approach of the book. And yes, you’d be right in a way that this book may sound daunting at first glance – it’s really not. Also thanks to a massive chapter guiding you through the implementation of rules, the cherry-picking process and manipulation/creation of more of them – before actually delving into several brief sketches of sample campaign settings sporting the rules- Oh, and, just in case you’re like me a grumpy guy and now would begin complaining about “magic not existing in its own vacuum” and things like “world consistency” – what about no less than 6 sample organizations, including traits and TPA/CPA-levels? Heck yes. But, you know me: I’ll still complain over the lack of NPCs. Well, we get those as well. And skeleton/zombie/animated object toolkits. Oh, and char-sheets. Editing and formatting are top-notch -while I noticed very minor inconsistencies here and there (one ability reading: (primary…) while another read (Primary…) and the like, at this point, any complaints about those sound hollow. One pet-peeve of mine makes me constantly cringe, though: The books gets cold damage wrong, constantly referring to it as “frost damage” etc. – something that btw. also extends to the expansion..but at least it is consistent in this glitch. Layout adheres to a beautiful 2-column full-color standard with ample of original full-color artworks. The book comes fully bookmarked for your convenience and provides an interactive version of the char-sheet. Unfortunately, I do not own the physical copy of this book, so no, I can’t comment on that version. Adam Meyers, Owen K.C. Stephens, Thomas Keene, Ryan Ricks – gentlemen, you have me utterly flabbergasted. It’s time to come clean here: I wasn’t excited about this book in the least. Not at all. I saw the KS and literally thought “Meh, don’t need it.” You see, the pitch of avatar/fiction-like spellcasting simply didn’t appeal too much to me. Damn, was I wrong. For one, sphere casting is much (MUCH!) better balanced than vacian spellcasting and the introduction of the material herein should end the martial/caster-strife for most groups. Secondly, this book actually manages something just about unprecedented: It manages to account for table variations in an almost uncanny way: You can use Spheres of Power with Interjection Games-classes, psionics, Akashic Mysteries…and actually get a balanced, cool game. similarly, you could highly restrict it and go full-blown gritty…or utterly anime-style high-fantasy. This system’s modularity is a thing of true beauty, its easy means for potential expansion a milestone. Now granted, there are some minor aspects I am not a fan of – stalwart, the destruction-sphere’s blasting and similar elements all didn’t blow me away – but see, that’s the beauty of the system: By means of its elegance and relatively open design, I see no reason why a capable GM couldn’t tweak, mesh and blend the living hell out of this system. Beyond an increased emphasis on meaningful player-agenda, tight rules-language and a holistic claim it actually manages to fulfill, spheres of power also has these cool tidbits: From the advanced customization to relics and incantations, this massive book takes just about anything you could complain about and tells you “Jep, already covered that…here.” This may very well be one of the, if not the most refined, yet open casting systems I’ve seen in a long, long time – one that still can, but doesn’t need to, draw on the vast canon of published Pathfinder-material. If the above, gushing monologue wasn’t ample clue for you: Spheres of Power is a phenomenal book, a tome of a quality you only rarely get to see and one that is, quite frankly, significantly better than the limited KS-pitch back in the day ever made me hope it could be. Spheres of Power is a universally, absolutely superb book, one that cannot only inspire characters or the like – it can inspire campaigns. It is my firm conviction that this book belongs into the library of the distinguished Pathfinder-GM: There is an exceedingly high chance that my next campaign will use these rules (alongside non-vancian casting classes by e.g. Dreamscarred Press and Interjection Games) to take a complete break from vancian spellcasting. Not because I don’t like spells and the vancian system – quite the contrary, actually. However, because I believe that using this book and using different spellcasting methods lets you tell a whole cosmos of different tales, of different power-levels and dichotomies between casters and non-casters. 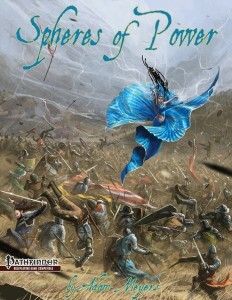 I’ll say it again – Spheres of Power is one of the most impressive books I’ve read in a long while; it may not be perfect, but it is a thorough inspiration and I staunchly believe that any group can benefit from at least contemplating using this book when starting a new campaign (or initiating a magic-altering event/switching settings, etc.). Spheres of Power is a milestone-level book I will certainly try to get in print. My final verdict will clock in at 5 stars, seal of approval, nomination as a candidate for my Top Ten of 2015 as well as the EZG Essentials-tag, since its facilitation for story-telling and its ridiculously high scavenging/system-fusion potential. A stellar tome, well worth every cent of its fair asking price. You can get this glorious tome here on OBS and here on d20pfsrd.com’s shop! If you want to support Drop Dead Studios making more Spheres of Power-supplements, you can do so here on their patreon! There is also a US-only Christmas Flash sale of Spheres of Power currently going, so take a look at the discounted version here on Drop Dead Studios’ site! Not being impressed by the Kickstarter… I know that feeling. I was one of the original backers, and I got it mostly because I thought it would be good inspiration for some non-gaming stuff. XD As I mentioned in my own review on Paizo.com, I genuinely did not expect this system to be as good as it is. I thought it would be an afterthought, sold to a few people and almost never even talked about, much less used – instead, I see people frequently suggesting it as a replacement for Vancian. There is also a hardcover. I don’t have one because I decided to get multiple copies to smooth over full replacement scenarios. To add the colored tabs for each chapter makes navigating the physical book pretty easy. Its about half a centimeter taller and wider than a Pathfinder Campaign Setting book. Great review! I, personally, liked Spheres so much that not only do I have a hardcover copy on my shelf, I convinced Adam to let me do a little work on the Expanded Options release. You brought it up in your review, but I was going to note that in one of my home games (sadly on hiatus right now due to the fact that several of my friends who play in that game are military and currently deployed) we actually use Spheres of Power and Akashic Mysteries side-by-side, treating SoP as a complete replacement for Vancian, and it’s wonderful. In a twist that was fairly amusing for me, the game world actually treats akashic magic as the stable backbone that the oldest civilizations are built around, and Sphere magic as a newer, wilder way of harnessing magical energy without the stability and form akasha provides. One of my favorite things about SoP is that it allows for the creation of very unique and memorable NPCs; the logic of the system reminds me of anime like Fairy Tail, where magic is consistent within the framework provided by the wielder and follows certain general rules, but its actual form and function will vary greatly from character to character. So, for example, I’ve had an Armorist with the Alteration sphere and the lycanthropy drawback who was presented as his transformations actually being another type of armor swap, able to change to different armors that provided things like flight, underwater breathing, etc., essentially a master of his equipment on a whole different level. We also had a suqur (hawk people from Akashic Mysteries Supplemental) incanter who would tuck in her wings and use her Destruction specialization ability to blast herself across the battlefield or into the air, making for a highly mobile and kind of hilarious rocket-bird. Really happy to see you review this gem. I’ve had the pdf for a few weeks now, and got a physical copy for Christmas (score!). I can’t say enough about this amazing book, it pretty much single-handedly fixes every problem I’ve ever had with the core magic system. I’ve tried explaining it to my friends and gaming group, and I guess you have to read the book itself to understand how good it really is because the only reaction I’ve gotten is a sort of disinterested shrug. I’m currently knee-deep in world building specifically so I can make use of this system, creating magical traditions and restricting their sphere access to highlight their differences. Want to be a Keeper of the Argent Flame? They grant access to Divination, Enhancement, Light, Nature (Fire), and Protection, and incorporate specially made silverflame tindertwigs into their casting. A member of the Convocation of Magi? You’ll get Conjuration, Creation, Destruction, Time, and Warp, and you gotta have your staff! Drop Dead Studios is now officially on my radar, right alongside Dreamscarred Press. I anxiously await their next offering, which I had heard was going to be an updated version of Rogue Glory. Do you know if that book is still in the works, after the failed kickstarter? Thanks for commenting! I agree wholeheartedly that SoP is great; Re Greater Rogue Glory: I’ll ask the DDS-crew, but I wouldn’t bet on it. Cheers and a happy 2016!